The only NFL team to win all their regular season and playoff games, the 1972 Miami Dolphins, were invited to the White House recently. Three members of the team didn't go, citing political differences. 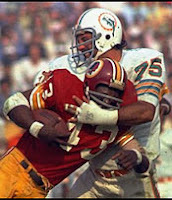 Center Jim Langer, defensive tackle Manny Fernandez, and offensive lineman Bob Kuechenberg declined to make the trip, telling the Orlando Sentinel they didn't want to associate with Obama. Bob Kuechenberg's first words were, "I want to be careful, because mom said if you have nothing good to say about someone, then don't say anything. I don't have anything good to say about someone." ..."We've got some real moral compass issues in Washington," Hall of Fame center Jim Langer said. "I don't want to be in a room with those people and pretend I'm having a good time. I can't do that. If that [angers] people, so be it." "I'll just say my views are diametrically opposed to the President's," Manny Fernandez said. "Enough said. Let's leave it at that. I hope everyone enjoys the trip who goes." ..."I think it's great if [other players] want to have that function at the White House," Langer said. "I have other stuff to do." He'll be fishing with his 4-year-old grandson, Max, instead of going to the White House. Being a grumpy old fart also, I understand their feelings. Sure, it's the White House. But, it's Obama. I get it. But, listening to some news shows and reading online comments, most columnists seem to think they should go. I think the reaction of the three that didn't go is perfect. Like their 1972 season. But but but, their federal master the king has summoned them! Obey your betters Citizen! So the rest of the team will go visit the occupant, will a real president be there? Maybe one of them will get a photo of bigfoot! These fine gentlemen are making it real hard for me to continue my lifelong hatred of the Dolphins. Sniveling and worshipful reverence for the president is a drain on our American society, like an antibiotic-resistant infection. He is nothing more than the chief officer of the executive branch of the federal government - one out of three, coequal branches. Now, I have a great deal of respect for the Office of the President. I've seen it. It's real nice, with very attractive furniture. But the person who works in it is a knave. Why the invite after 41 years? Obama using his position to meet even more famous people and make himself feel important? Recruiting the AARP aged NFL stars to try and sell his major accomplishment failure? Something about the visit smells fishy and it ain't the Dolphins. apparently the Dolphins have moved to the east coast: Sports fan alarmed!